FRANKLIN, Mass. – The Panthers have been on a roll in Hockomock League play. Franklin came into Sunday night’s game with King Philip at Pirelli Veterans Memorial Rink having won 14 straight games in the league, including a perfect 10-0 last year and the first three games of this season’s league schedule. But as the clock was winding down in the third period, the Warriors looked poised to end that remarkable win streak. With 6:23 left to play, Joey Blasie pounced on a rebound to knock the puck home and finish one of Franklin’s numerous scoring opportunities. The goal canceled out Sam Ross’ first period goal and sent both teams home with a point. The Panthers came out sluggish in the first period. Passing was erratic, the skating was slow, and the hosts struggled at times to control the puck. KP took advantage. Jeremy Smith sent the first warning shot with a blast from the point that rang the post off a face-off win by Nick Connor. Two minutes later, Matt Smith slid a pass across the crease to a wide open Jacob Kelly but the junior forward’s shot from point-blank range was chipped over the bar. With 8:05 left in the period, KP made the Panthers pay for the slow start. As Blasie raced from the box back into play, Ross found himself with the puck on his stick on the right side of goal and flicked his shot on net. The puck slipped through a screen and under Nick Jasinski’s pads for the opening goal; the first of the season for the senior. Franklin had its chances as well. Remmes made 36 saves on the night and he was increasingly put under pressure as the game wore on. He made a quick reaction kick save to rob Thomas Sicchio in the first and then somehow managed to get a piece of a Jake Downie shot from the edge of the crease; sitting on the puck and keeping it out. In the third period, just a minute before Franklin tied it, Remmes kept KP in front by getting a toe on a chance for Jeremy Miller who was left all alone by a great pass across the front of goal by Adam Assad. In addition to the play of the KP goaltender, Franklin also missed a series of good chances. Brendan O’Rielly had a chance on an open net after Remmes stopped Tyler Oakes’s shot from the point in the first but smashed his shot off the bar. Luke Downie had a similar opportunity in the second on a rebound, again from an Oakes shot, but his effort bounced away off the far post. The Panthers outshot KP 16-4 in the second period, but the Warriors still created chances. Matt Smith skated in alone but his shot missed the net at the short side. As the period wound down, he had another good opportunity, this time from the right circle, and again went for Jasinski’s blocker side but again it went wide. In the opening 30 seconds of the third, Smith set up Ross in the slot but Jasinski (16 saves) was positioned well to clock the shot. The pressure would eventually tell for the Panthers. Luke Downie collected the puck behind Remmes and tried to skate in front and score but the goalie kicked it away. Unfortunately for KP, the rebound went straight to Blasie and finally Franklin had someone finish. Spillane said, “I give them a little credit that they worked hard to grab a point and we battled, but these are games that they have to come out and play 45 minutes. If they don’t play 45 minutes then this is the result against any team in our league. With 3:20 left, Franklin nearly won the game when O’Reilly’s shot slipped past Remmes and sat right on the line. Cory Lombardo saved his goalie and his team by clearing the puck away. Franklin’s momentum was stymied as twice in the final 5:30 the Panthers were forced to go on the penalty kill. “They were just unnecessary penalties that put you on the kill and then you’re wasting guys legs as the clock is ticking down,” Spillane said. The Warriors scored five unanswered goals in the third period on Wednesday to come from behind and beat Taunton. Carlow believes that energy and confidence carried over and helped the Warriors grab a point at Franklin. Spillane was clearly disappointed with his team’s performance. After so much success in recent seasons, this may be a wake-up call for an atypically inexperienced roster. When Spillane was asked about it, he chuckled. On Wednesday, Franklin (5-3-2, 3-0-1) will play host to divisional rival North Attleboro in a huge game in the Kelley-Rex standings. King Philip (5-4-1, 3-1-1) will travel to Aleixo Arena to face Attleboro. North Attleboro, 62 vs. Falmouth, 57 – Final – Chad Peterson was the top scorer for the Rocketeers with 14 points. Brent Doherty and Jonny Friberg each chipped in with 10 points apiece while Thomas Reynolds and Ridge Olsen each had seven. King Philip, 1 @ Franklin, 1 – Final – The Warriors took the lead with 8:05 left in the first period on a goal by Sam Ross (assisted by Cory Lombardo and Kyle McCarthy). Franklin tied the game with 6:23 left when Joey Blasie was first to a rebound of a shot by Luke Downie. 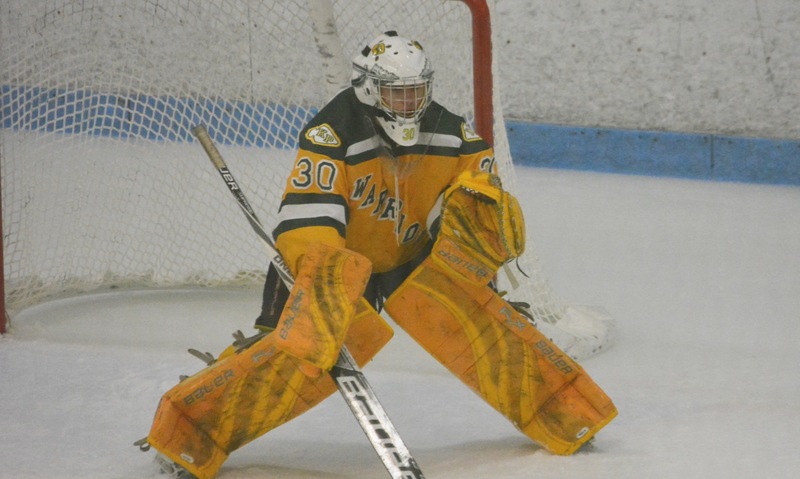 Evan Remmes made 36 saves for the Warriors, while Nick Jasinski made 16 for Franklin. BROCKTON, Mass. 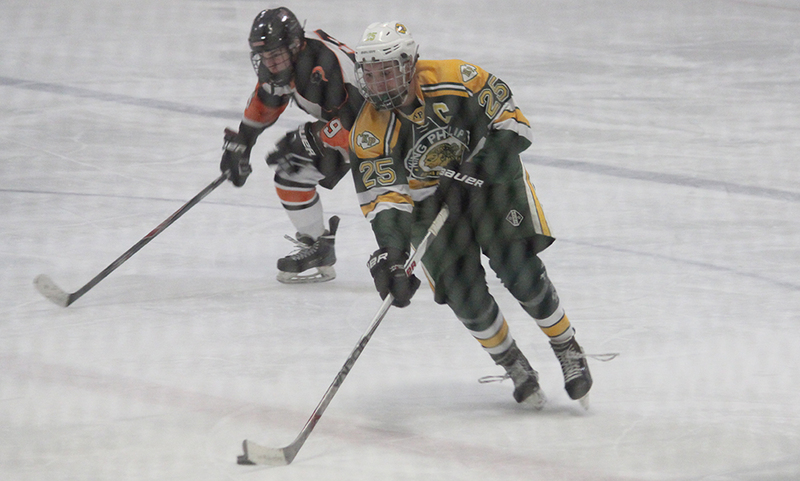 – King Philip scored at all the right times and skated away with a 6-1 win over Stoughton at Asiaf Arena on Saturday afternoon. With the game tied 1-1 in the first period, King Philip scored the all important go ahead goal with less than four minutes to play in the opening frame, then created a two goal cushion less than six minutes into the second and iced the game with three third period goals. The Black Knights went ahead less than five minutes into the game, converting on a loose puck in front. After the net came dislodged, Stoughton had an offensive zone face off. The puck went behind the net and was deflected by Adam Potter right out in front where senior Barry Cooke backhanded it in with 10:43 left in the first. King Philip responded just four minutes later, converting on the power play. With just six seconds remaining on the man advantage, Kyle McCarthy ripped a shot that was deflected by Matt Smith right in front to tie the game with 6:45 left in the first. The Warriors then took the lead for good when Jacob Kelly scored off assists from Matt Smith and Sam Ross. After giving up the opening goal, KP held a 2-1 advantage at the first intermission. The next goal would be an important one and it came from Clay Geuss just over five minutes into the period. The senior took a pass from fellow defenseman Cory Lombardo and stepped into a shot that took a deflection off a Stoughton player and found the back of the net to make it 3-1. Just 30 seconds after KP’s goal, Stoughton thought they had pulled within one but the goal was waved off due to the net being off. The Warriors outshot the Black Knights 14-4 in the period but Stoughton freshman goalie AJ Scott made 13 of his 40 saves in the period. King Philip made sure to add another insurance goal early in the final period. Just 27 seconds in, McCarthy ripped a shot from just inside the blue line that went wide but took a big bounce off the boards and came back and bounced in off a Stoughton player and in. Jeremy Smith then took a pass from brother Matt Smith and Ross and ripped a slap shot upstairs from just inside the blue line to make it 5-1. McCarthy grabbed his second of the game with just over a minute left, weaving through two defensemen and finishing with a wrist shot. The Warriors had four goals from defenseman. Shane Frommer made 16 saves for the win in goal for KP. King Philip improves to 4-4 overall and 2-1 in Hockomock League play. The Warriors will try to make it two in a row when they travel to Taunton on Wednesday at 6:00. Stoughton (2-5-3, 0-3) will play host to Canton on Tuesday night at 7:30. TAUNTON, Mass. – King Philip’s offense scored early and often and built a big lead early and never looked back in 47-22 win over Taunton. The Warriors brought the pressure early and Chris O’Neil came away with an interception on Taunton’s third play of the game. King Philip used nine plays to cover 57 yards — all on the ground — before junior Sean Garrity burst straight up the middle for a 10 yard touchdown and the Warriors went up 6-0 less than five minutes into the game. It was more of the same in the first half as King Philip scored on every single possession in the first half. Defensively, the Warriors allowed Taunton to gain just 23 yards on their first five drives and had a pair of takeaways. Taunton was forced to punt on its second drive and the Warriors took advantage of very favorable field position. Starting at the Taunton 36 yard, it only took KP five plays to find the end zone again. This drive, highlighted again by a long run from quarterback John DeLuca, was capped off when DeLuca hit senior Cory Lombardo out of the backfield. Lombardo caught the ball around the seven yard line and fought his way through three tackles and dove into the end zone. DeLuca’s keeper for the two point conversion made it 14-0 as time expired in the first quarter. King Philip was able to add to its lead very early in the second quarter. A dropped snap from Taunton was recovered by Brett Mazur at the Taunton 24 yard line and on the first play, DeLuca threw a strike over the middle to junior Mike Mello for a touchdown to make it 20-0. A quick three and out gave the Warriors the ball back, this time at the Taunton 45 yard line. A four yard rush from Gio Fernandez preceded a 13 keeper from DeLuca and a 24 scamper from Garrity. DeLuca kept it himself and pushed it in from three yards out to make it 27-0 with 8:01 left in the second quarter. Six minutes later, Gio Fernandez capped an eight play, 59 yard drive with a run from five yards out to make it 34-0 with 1:59 left in the first half. Taunton put together its best drive on its next series, going 62 yards on 10 plays in exactly 1:59. Facing third and eight, Jason DaRosa picked up 14 yards to move the chains. Three plays later, sophomore quarterback Collin Hunter hit junior Adam McLaughlin on a hitch route and McLaughlin beat his defender and ran for a 35 yard gain to the 10 yard line. On fourth and goal from the six with just one second left, Hunter rolled away from pressure to the left and fired to an open Tanner Costa for the touchdown to make it 34-06 at halftime. To start the second half, Taunton was able to limit KP to just three yards on its first two carries and put them in a third down situation. But sophomore Shane Frommer (70 yards) broke out for a 27 yard gain and a first down. On the next play, Brendan Lydon completed an 18 yard pass to Mello for a touchdown to make it 40-6. Taunton also converted on its first drive of the second half. A third and five was turned into third and 10 after a false start but Hunter found Damion Theodule over the middle for a 20 yard pick up. Two plays later, Hunter connected with Costa on a screen play and he raced all the way for a 47 yard touchdown to make it 40-14. For the seventh straight drive, KP was able to find the end zone. The Warriors went 12 plays and covered 66 yards, mostly on the back of Michael Conti (eight carries, 33 yards) and Lydon used a keeper to punch it in from a yard out. Taunton had to punt but was able to get the ball back when Amir Rehim pounced on a fumble. The Tigers took advantage of that as Hunter hit Costa for a 39 yard gain to get to the 12 yard line. Three runs from Lazare Joseph pushed Taunton to the one and Hunter used the QB option to get it in from 1 yard and make it 47-22. DeLuca was 2/3 throwing the ball but added 62 yards on the ground on five carries. Frommer, Fernandez and Garrity all were over 50 yards as well. For Taunton, Hunter was 8/23 for 150 yards with a pair of touchdowns while DaRosa had 48 yards on nine carries. 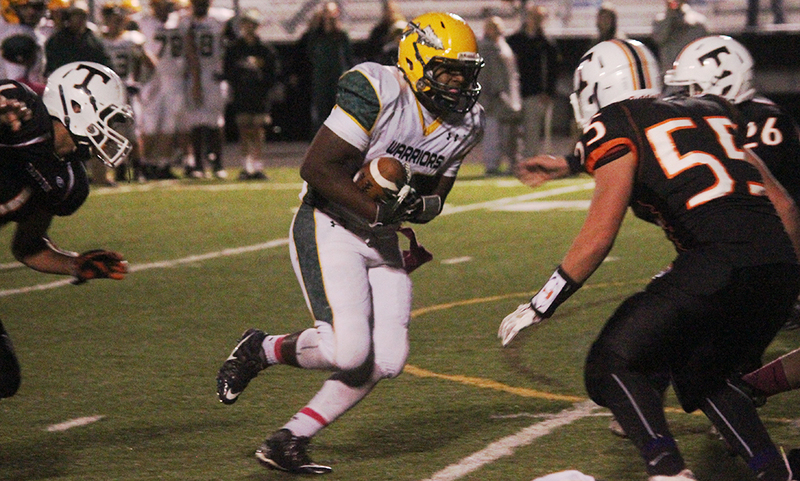 King Philip (3-2, 3-4) finishes in a three way tie in the Kelley-Rex and will make the playoffs in Division 2 South. As of publication of this recap, KP is seeded 5th according to the Boston Herald and would travel to #4 Mansfield. With games still to be played, that could change. Official seedings will be announced on Sunday and we will have an update on the website. Taunton (0-5, 0-7) misses the playoffs and will match up with another team that missed the playoffs next week. Key/Returning Players: Kyle Murphy, Sr., OT/DT, 6-4, 275 lbs. ; Brendan Nunes, Sr., WR/CB, 6-0, 175 lbs. ; Tyler McGovern, Jr., QB, 6-3, 190 lbs. 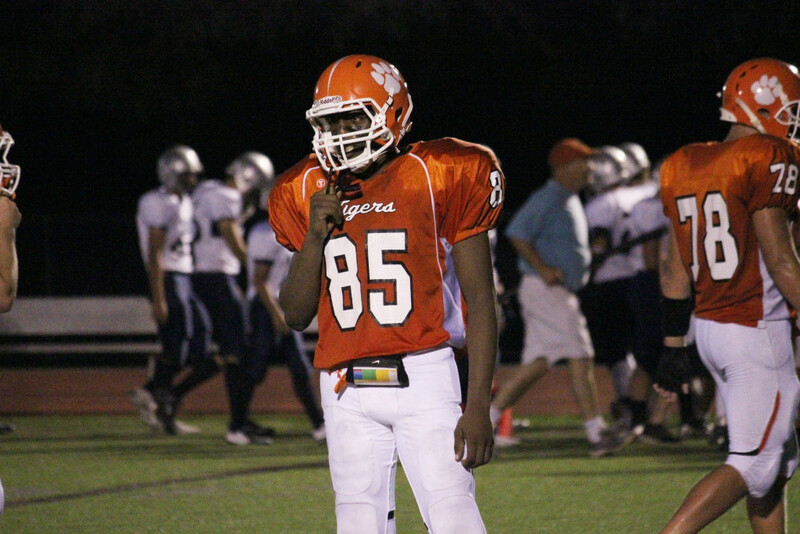 ; John Burns, Sr., FB/OLB, 5-9, 165 lbs. ; Alex Silva, Sr., TE/DE, 5-11, 185 lbs. Brendan Nunes is one of the receivers that Attleboro is hoping can turn into a primary target along with senior tight end Alex Silva, although there are question marks about who can become the No. 1 back to take pressure off McGovern and the passing game. Defense should be a strength for the Bombardiers, who bring back almost all of last year’s starters. Murphy can dominate the line of scrimmage and forces double teams and game plans that can open space for his teammates. John Burns and the linebacking corps will be hoping to take advantage of that extra room to make plays. The Panthers will be starting a new quarterback this season with junior Brad Jarosz expected to take over under center and he will have plenty of weapons to use in Franklin’s typically up-tempo offense. Nick Yelle will be in the backfield along with Jake Lyons, while Sam Harrell, Will O’Reilly, Luke Gordon and Eddie Scannapieco are all back on the outside. The offensive line is improved, according to Sidwell, although it may lack depth in case of injuries. Ben Riggs and Joe Giacolone are two-way linemen that can be dominant on both sides of the ball. Defensively, Franklin will hope that the skill position players continue to develop into strong players in the secondary, while counting on junior defensive end Tyler Gomes to continue his emergence as a strong presence in the pass rush. Franklin will be counting on the opening games against Arlington and Milford to prepare it for the battles to come in the Kelley-Rex Division. 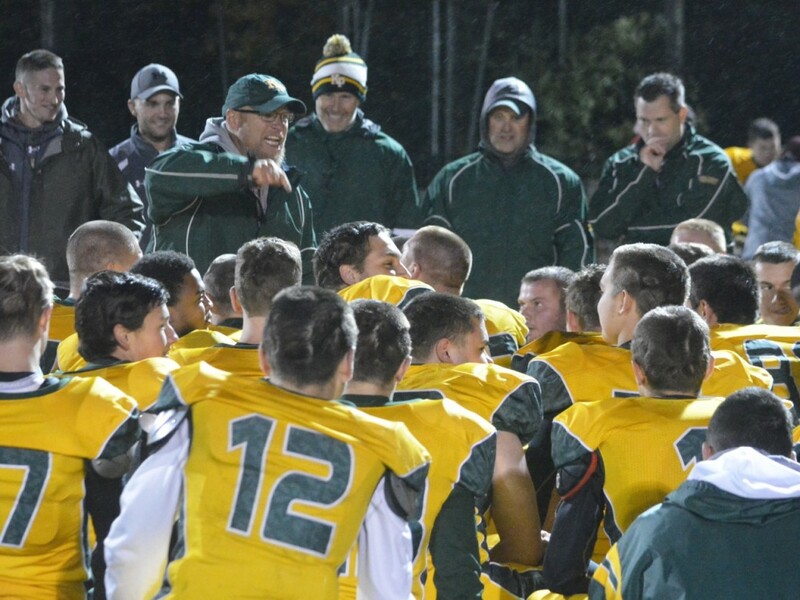 Outlook: King Philip is coming off its first outright league title and a trip to the Div. 2 South final where it gave eventual state champion Marshfield one of its toughest games of the season. The Warriors are a team based on ball control offense and hard-nosed defense and despite losing a strong core from last year’s squad, head coach Brian Lee will ensure that KP remains a tough team to play against even with a host of young players. 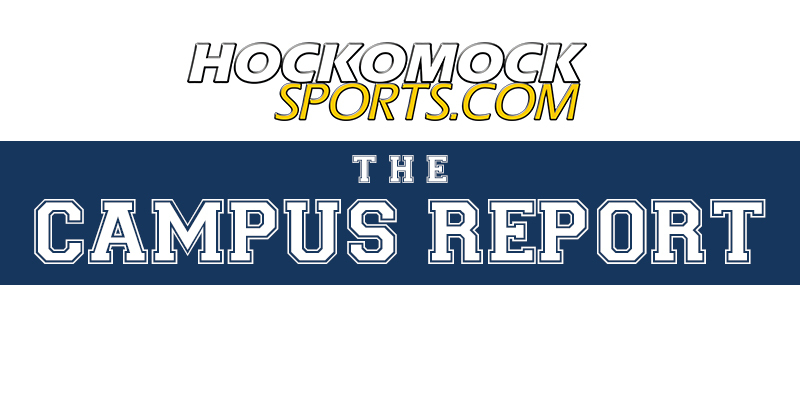 Quarterback John Deluca returns for his junior season, but without some of the weapons that were so prolific from last year including HockomockSports.com Player of the Year Mark Glebus and wideout Kyle Loewen. Senior running back Steven Eaton will take most of the carries and is hoping to develop some of the explosiveness that made Glebus such a weapon last year. Junior Gio Fernandez also saw some carries last year and is a load at running back, especially in short-yardage situations. Senior R.J. McCarthy is a player to watch at receiver. The offensive and defensive lines remain a strength for KP with Bill Dittrich and James Cooke returning. Nick Bernier Garzon will also help out on the line, but the key to the defense is senior middle linebacker Cory Lombardo who will be the leader and continues the pattern of strong linebackers at KP. Key/Returning Players: Diogo Desousa, Jr. K/DE, 5-11, 182 lbs. ; Connor Finerty, Sr. RB/LB, 5-11, 200 lbs. ; Anthony DeGirolamo, Jr. QB/DB, 5-11, 165 lbs. ; Ben Wisnieski, Sr. RB/DB, 5-10, 160 lbs. ; Hunter Ferreira, Jr. WR/DB, 6-1, 185 lbs. ; Brian Lynch, Jr. RB/DB, 5-8, 170 lbs. ; Nick Krouskos, Jr. FB/LB, 5-9, 175 lbs. ; Mike Arnold, Sr. TE/DE, 6-1, 205 lbs. ; Josh Schafer, Jr. OL/DL, 6-2, 230 lbs. ; Matt Kashtan, Sr. OG/NG, 5-8 195 lbs. ; Joe Bukuras, Jr. RB/DB, 5-9, 160 lbs. ; A.J. Gibbs, Jr. OL/DL, 5-11, 270 lbs. “Overall, we’re on the young side and a little undersized, but very talented at skill positions and we have very good overall team strength and good team chemistry and leadership,” said Redding. Mansfield will be making a change under center with junior Anthony Girolamo taking over and his task will be made a little easier by the talented backfield of senior Connor Finerty and junior Brian Lynch, who is coming off a breakout sophomore campaign that saw him rush for eight touchdowns and more than 800 yards. In addition, the Hornets have talent on the edges with receivers Ben Budwey and Hunter Ferreira and athletic tight end Mike Arnold. Junior Josh Schafer will be a player to watch on the line. Finerty headlines the defensive unit as the outside linebacker and leader on that side of the ball. He will be joined by Ferreira and Anthony Keefe on the outside with Nick Krouskos, Travis Sjoberg, and Nick Martin in the middle. The real strength of the defense could lie in the secondary with all four starters returning and plenty of depth behind them. Joe Bukuras and Connor Driscoll are the corners with Ben Budwey and Ben Wisnieski at safety. Special teams will also be strong with returning kicker Diogo DeSousa, who Redding calls “one of the best kickers” he has had in his time with the Hornets. Outlook: After a stunning home loss to Medfield in the opening round of the Div. 3 Southwest playoffs last fall, North Attleboro returns a number of skill position players with hopes of making a run at the Kelley-Rex Division title. The backfield is loaded with seniors Connor Flynn, who averaged 12.1 yards per carry until a wrist injury kept him out, and Nick Morrison providing steady hands and downhill running while being pushed by the explosive duo of juniors Nick Rajotte and Bobby Mylod, who combined for 13 touchdowns last season. Head coach Don Johnson said of his running backs, “All four backs are versatile and can play multiple positions.” On the outside, North boasts plenty of size at wideout with 6-foot-5 senior Ridge Olsen on one side and Kyle Gaumond on the other. Defensively, North has loads of depth on the line if not loads of experience. Senior twins Josh and Sam Morrison will split time along with senior Davon Andrade and senior defensive tackle Andy Katch, The linebacking corps features Mylod in the middle with Flynn and Nick Morrison on the outside. In the secondary, Gaumond, Barr, Rajotte, Olsen, McCarthy, and Patrick Johnson will all be in the mix depending on match-ups. Outlook: The Tigers are coming off a 2-9 season and will have a new quarterback under center, but head coach Chris Greding is counting on his depth on the line and at the skill positions and overall team speed to get Taunton in the mix in the division. Senior Brain Cherenfant is one of the fastest players in the league and gives the Tigers a weapon both on offense and in special teams. He will be joined in the backfield by Jason DeRosa, Lazare Joseph and Coyle transfer Tanner Costa, giving Taunton a number of weapons. Adam McLaughlin will be a player to watch at wideout. The line has also been strengthened with Jake Norberto and Santiago Lopez coming back on the offensive side of the ball and Jared Williams on defense. Connor Briggs will be another player to keep an eye on opening holes for the backs, while the defensive line is bolstered by Florida transfer Sylvester English, Texas transfer Nick Brown, and Boston transfer Zakeem Harrow. The linebacking corps includes Matt Grey and John Chretien, while Breven Walker, Cherenfant and Costa will all play bog roles in the secondary. One of the better lineman that didn’t get much attention last year was Canton’s Mac Brown. He’s got solid size but possesses his ability to move and find the ball was huge for the Bulldogs last year. We’d be remiss to not mention how impressive Brown is on offense but we expect a big year on defense this season. If teams want to run to Brown’s side, don’t expect a big hole to open up. He has the ability to take a lineman on one-on-one and will be a big factor for the Bulldogs this season. One play that stands out was on special teams (a gigantic hit in a game against Stoughton) but it was just a taste of the power that Cardoza has. The burst he displayed coming off the line made it very tough for opponents to try and match up with him. It seemed with within a second of the ball being snapped, Cardoza was in the backfield disrupting the play. He’s strong enough to go through you and he;s fast enough to go around you. It won’t be very fun for the players who have to get hit by Cardoza this season. After graduating a handful of talented and experienced seniors, the Warriors are going to rely heavily on the returning players that did see substantial time last year. Downs saw plenty of time at linebacker this season and will be on of the best at that position in the Hock this year. Downs shows some patience at linebacker and reads the play well and attacks. As the play develops, Downs is quick to figure it out and react. Although it’s just one play, take last year’s game against Stoughton for example. Downs came right up the middle right to Stoughton back Joey Girolamo. Despite Girolamo being one of the toughest backs in the league, Downs was able to get right past him for a sack. We might be seeing that more often this season with Downs. After recording a team-high in sacks last year, Connor Finerty is back for what could be a very big senior campaign. On top of his three sacks, Finerty had five tackles for loss, which was second on the game and forced a fumble. Strength is one of his biggest attributes which makes it tough for opponents to stop him – on both sides of the ball – but his speed complements his power which makes him even more dynamic. Finerty, a captain for Mike Redding this year, has the chance for a special 2015. On offense, Connor Flynn is part of a three-headed monster rushing attack with Nick Rajotte and Bobby Mylod. On defense, Mylod’s versatility makes him a dangerous player. Whether it be as a corner or a linebacker, Flynn is likely to make a play. He’s able to track the play well and then attack and make a play. The Rocketeers lost some good playmakers to graduation and will be looking for players to step into those roles. Flynn might be one of those players. During his sophomore season, Tyler Gomes made himself familiar with opposing quarterbacks time and time again. In seemed like every game, Gomes was finding his way through the offensive line for a sack. Gomes’ athleticism and strength allow him to take opponents on one and one – if teams don’t double team him. Expect Gomes to draw a lot of attention and be a big factor as the Panthers make a push to return to the postseason. Blake Hill might have been one of the most underrated players on the defensive side of the ball last year. At the linebacker spot Hill was all over the field for the Scarlet Hawks. He did well to read the play and then attack and make a play. Milford graduated a lot of talent but with Hill back, he will be able to make an impact on both sides of the ball. Even if the play goes away from him, he doesn’t give up on the play and tracks it to the end. Hill is also a threat on the offensive side of the ball as he can take off with the ball in his hands and run over defenders. There are only two Kelley-Rex Hockomock League All Stars coming back and Cory Lombardo is one of them. During the Warriors’ historic run last year, Lombardo was an anchor on defense and really helped define KP’s style and attitude. With KP graduating a ton of talent on both sides of the ball, Lombardo is the perfect player to help set the tone for the players stepping in. He does well to read the play and has real good strength. Good luck to anyone that’s trying to get past Lombardo. The Black Knights lost a lot of talent when the Class of 2015 graduated but expect Stoughton to reload to be just as tough on the defensive side of the ball. One player that got some experience last season that is back this year is senior Xzavian Marrero. Marrero got time at corner last year and will be one of the top players at that spot this year. One reason Marrero is able to excel in the secondary is because of his tremendous athleticism. Whether it be going up and defending a pass, tracking down a ball carrier or laying a hit on someone, Marrero can do it. There are certain players that can change a team’s game plan and Kyle Murphy is one of them. Whether it be on the offensive line or the defensive line, Murphy is good enough to dominate on any given down. Since his sophomore year, Murphy has been a headache for offensive guards and tackles. Not only is Murphy’s size an advantage, his combination of quickness and strength is not something you see everyday. Last year in the playoffs, Murphy showed off how good he really is with his performance against eventual state champs Xaverian. Expect a lot of teams to pay plenty of attention to Murphy this season.